Home destination holidays the fort Boyard the Island Oleron tour travel travel destination travel destinations Vacation Enjoy your vacation at the island of Oleron!!! This beautiful Island is in the French coast, Oleron means “Light”. This is an ideal destination for your vacation. Enjoying the sunny micro climate you can view their flora rich with tamarind, mimosa and oleander. You can explore the forests and swamps by foot or by horse. You should definitely visit The Swam Birds in Dolus and the Port Salines at the Grand village. And if you want to enjoy the wilderness of the wild life don’t forget to visit Myocastor Park. The mills also beautify the beauty of the island. The Island of Oleron has an astonishing architectural heritage with the blend of fortification, maritime monuments, churches and local architecture. Once it was a military strategic place and hence the island was endowed with citadels to protected Oleron. The constructions of these citadels were initiated by Richelieu in the seventeenth century. 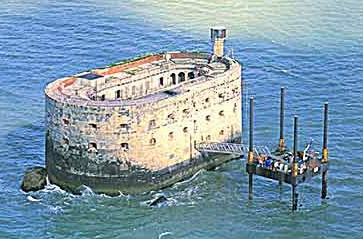 The Fort Boyard is the most popular monument. You don’t forget to visit the former prison and the rowing it around by boat is worth enjoying. Oleron the beautiful largest island of the French Atlantic coast has more than 100Km of sandy coast. Its beautiful sandy beaches are the nature made play ground for your kids and you family. This is the paradise of winter sports; you can indulge in joy of surfing, sailing, yachting and wind surfing. Last but not the least; the local delicious mouth watering cuisine is worth mention. Oysters, mussels, fish, other sea food, fruits and vegetables procured from the locals with the country wine are a unique combination you never forget throughout your life.